The front cover of this book sports spilled cheerios. I find this inviting to as it would seem from first glance that the author knows the reality of raising children. I also found it a perfect match for the coffee stains my copy has. I realize reading this that I think we could all write our own after becoming seasoned parents. (if we knew how to tell a story as well as Jennifer Grant) She gets straight to the point in the fact that you will never be that perfect parent that you thought once you may become. In the real world Cheerios are dumped on important papers that you need for your boss, and everything is not all sunshine and roses. Moms make commitments to volunteer at things trying to do all that is expected of her idea of a perfect parent. Moms are judged by parents who have one or no children and have no clue of the reality of raising a family. Your imperfect world is just perfect enough in the end. She shares her life as a child and how she lets go of things from her past to become what she has today. I really enjoyed reading this and felt like I could relate to it. In the back she list 5 items moms should not be without plus ideas on how to use them. Cheerios and Sharpies are on that list. Disclosure: I received a copy of this book for my honest opinion. We moms often set impossible standards for ourselves, and feel that we can never be “a good mom.” Or at least a good enough mom. Momumental was so encouraging to me as a mom. 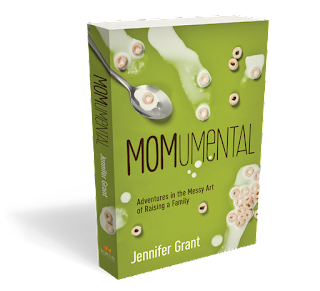 Jennifer Grant offers solid advice, not just on parenting but on how to be intentional about building a family culture. She writes honestly about her own mistakes, her own perfectionism, and how her own family of origin impacted her. She also tells beautiful stories about her family that made me laugh and cry. I’m recommending this book who anyone who is raising children—which is a messy but beautiful art. I loved it also. Thanks for stopping by.